Binge Hotpot isn't a get down and dirty all-you-can-eat hotpot place like the name suggests. Instead it's a dressed up version of mala spicy hotpot- with an art gallery-like space and stark white ceramic place settings. There are a few other things that set Binge apart from other mala hotpot places I've been to- besides the spicy mala broth with duck's blood and tofu, they also have a Thai curry broth or a plain broth. You can adjust the spiciness of the broths to your preference. The reason why my friend chose Binge was because she saw an assortment of yummy appetizers featured when she saw the news clip. But when we looked over the menu and asked the waitress, she replied that the hot, crispy fried things she saw featured like radish cakes, were actually not appetizers, but for cooking in the hotpot. Despite our pleading, the waitress insisted that they couldn't prepare them as appetizers and we couldn't eat them as such since they weren't fully cooked. There were even handmade balls with shrimp and cheese inside (NT$240)... unusual and a strange combination with the mala and curry flavoring from being cooked in the broth. As someone who likes the crispy and the soup separate- for example, I always request my shrimp tempura on the side of the my udon- who likes soggy shrimp tempura? This had sort of the same effect. Since it was our first time, we asked the waitress to order an assortment of stuff for us from the overwhelming menu, but mostly what came out was fried goodies that we couldn't eat until they were soggy. So if I returned to Binge again, I'd stick to the basics- vegetable combo (NT$160), meat (NT$280-680) and you tiao or fried bread sticks (NT$60) which do stay crispy after being dipped in the hotpot if you don't bathe it too long. Or some of their other homemade dumplings or meatballs that aren't fried. There's also a large selection of seafood which might go better with the thai curry broth rather than the mala broth. There's also also cantonese noodles or rice noodles if you need some starch. No packages of instant ramen here. A complimentary sweet, Chinese soup dessert comes to the table, but I only have a few bites. 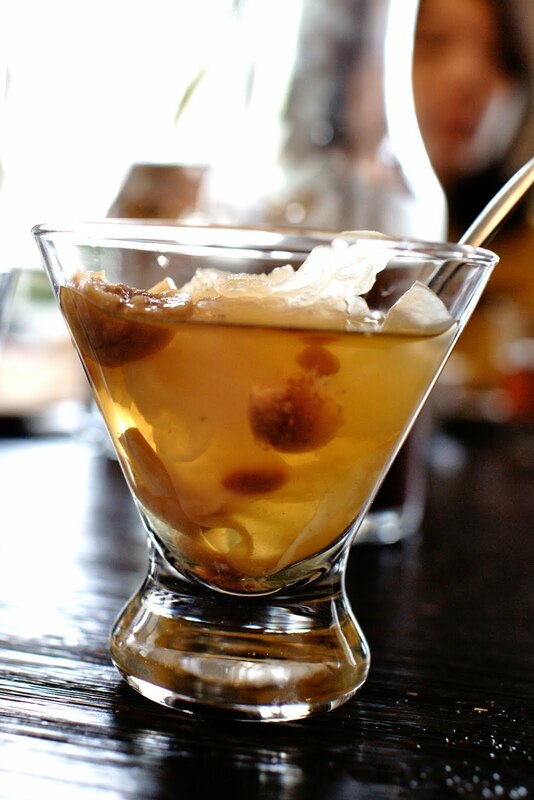 The clear, crunchy jelly-like parts are called snow fungus and is supposed to be good for you. One of the good things about Binge is it wasn't as crowded on a weekday lunch as the more well known Ding Wang Tripod King across the street, that we can spot outside our window seats. Binge is open late at night too, so you could come by for a late dinner and it's suitable for groups and a bit more spacious than other hotpot places I've been to. I've been a bad blogger. Instead of writing about food, I've just been daydreaming about it. In attempt to kick my semi-writer's block created by my return to the Taipei heat and humidity, I'm going to torture you with what we can't have (unless you're lucky enough to be in LA, of course). I have lots and lots to catch up on about my previous Taipei eats, but until then we will drool together. 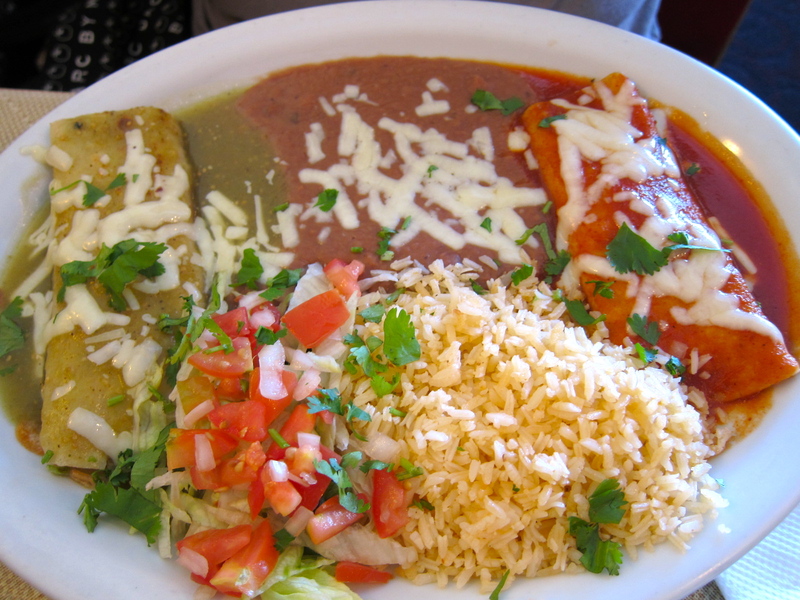 Heaping plates of El Salvadorian and Mexican food, complete with pools of beans and rice, and service with a smile makes Gloria's Cafe one of my favorite spots to hit up in LA. Ever since ordering the carne adobada on my first visit there over a year ago, I can't seem to want to order anything else. My sister said she doesn't even like plantains and she thought that these were good. We also went a little crazy ordering both the Mexican and El Salvadorian tamales with two different sauces to try- the El Salvadorian tamales tasted a bit smoother and creamy, while the Mexican tamales had the familiar courser, yellow corn masa texture. Both were the best tamales I've had in awhile. Ludobites 5.0's menu included dishes like goat cheese soup with bacon, lardo, tofu, green apple and frisee salad; foie gras with chinese bbq sauce with miso eggplant; steamed duck with crispy skin puree and white peach with balsamic (my 2nd favorite dish of the night); raw waygu beef over somen noodle; and campfire smores with a side of guacamole ice cream, but my favorite of the night was the Poached egg, Potato Mousseline, Santa Barbara Prawns and Chorizo Condiment. 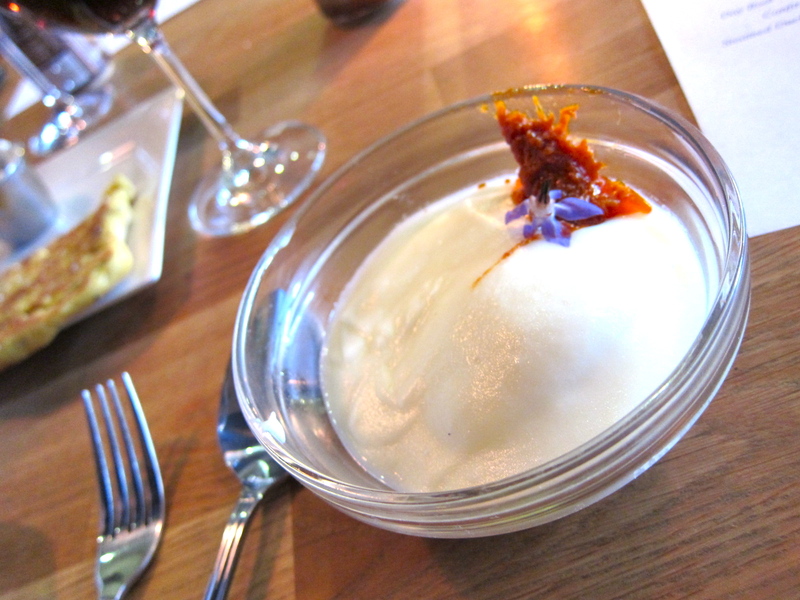 The dish sounds and looks deceptively simple, but it was actually perfectly thought out and executed. To have a complete dreamy bite, it was like hunting for treasure. You needed to scoop up the creaminess of the potato, the soft egg, the bite of prawn and saltiness of the chorizo. I could eat this for breakfast and lick the bowl clean. I thoroughly enjoyed the experience of Chef Ludo's imaginative creations while spying on him in person at work, as well as just having a nice dinner out with friendly service led by Ludo's wife, Krissy. It was my first time and hopefully not my last. I'd been wanting to try Umami for awhile, but never managed to make the drive out to Hollywood. But luckily for me, they have a location in Santa Monica now (in Fred Segal) which wasn't too crowded when we chose it for a lunch meeting on a weekday. The menu has about 8-9 burgers on it, but I recommend getting the signature Umami burger, best suited for those who like a bit of sweet with their savory. Don't forget to rock the sweet potato fries and cheesy tater tots too. If I could find a Chinese chicken salad in Taipei that matched the one from CCC, I'd be a happy camper. But it's hard to find a good salad here, much less a Chinese chicken salad. 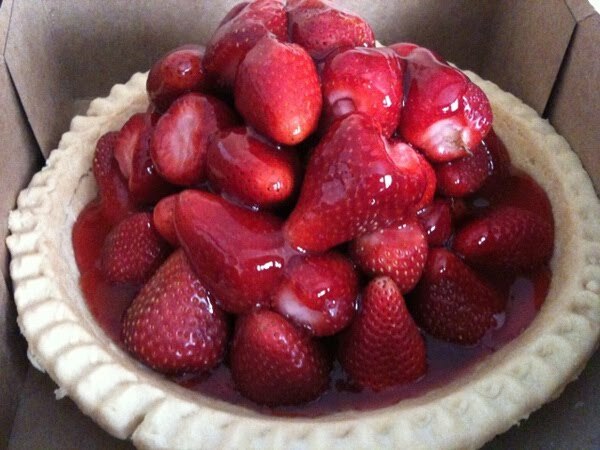 And last, but not least... the strawberry pie from Marie Callender's. Big, juicy strawberries bathed in sticky sweetness countered by a bite of the flaky crust. Hopefully this will still be in stores at the end of summer when I go back to LA in a few weeks. And speaking of seasons, does anyone know why strawberries are in season in the winter in Taipei, but during the summer in the states? It always confused me! So there you have it... some of my LA meals from my most recent visit- some old favorites, some new. The next time I go to Hong Kong, I'll definitely make a point to swing by Wing Fat Bakery for their egg tarts. Best eaten warm so that the jelly-like custard and buttery, flaky crust make melty magic in your mouth, I bought a box to share and even devoured one for breakfast the next morning. Thankfully I found a egg tart place that satisfied on my trip a few weeks ago- on my trip to Hong Kong last year, I found a random bakery when I got lost walking from my hotel to my lunch meeting, but was not able to find it again since. 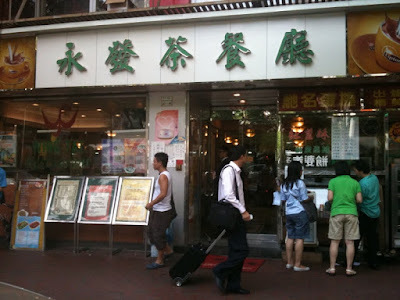 If you're craving hot egg tarts in Taipei? I'd recommend going to Parents Restaurant and ordering it about 20 minutes before you want to devour them. Anyone else have any leads for delicious egg tarts in Taipei or Hong Kong? 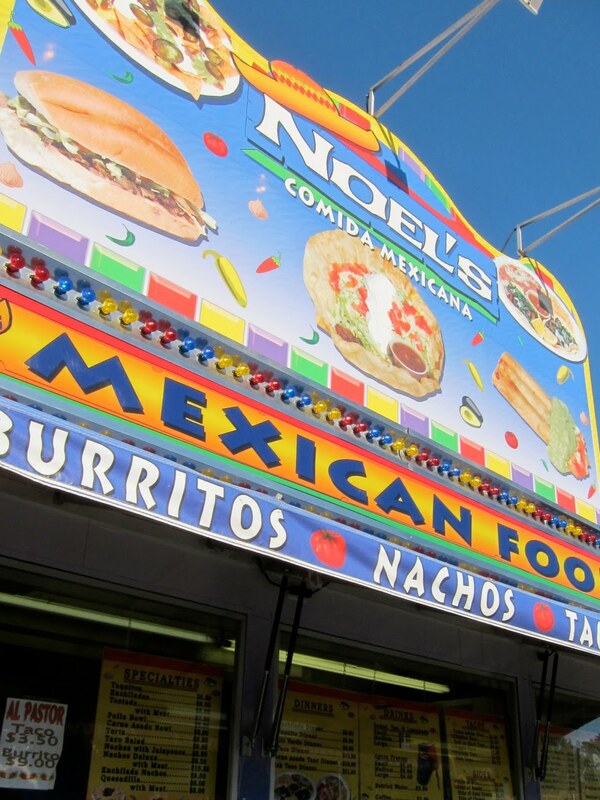 For me, summertime in Southern California means time to go to the OC Fair for Mexican funnel cake! Ever since I tried the sugary, crispy confection last year, I had been counting down the days until I returned this summer and could get my hands on it. It's always fun to see the dizzying array of food stands available- from the standard corn dogs to chicken and waffles to grilled corn. It's amusing to see the cupcake trend has even made its way here. I didn't have the urge to try all the deep fried craziness like the zucchini weenie or the deep fried smores, since I had sampled it last year. 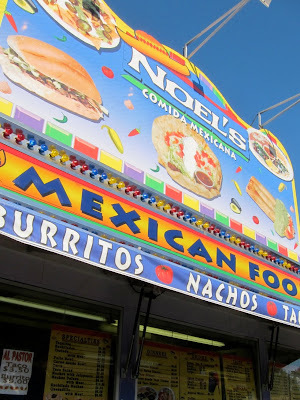 So instead I settled on some taquitos from Noel's since I spotted an open table nearby. I was happy to see it slathered in guacamole. I also tried corn dogs from a couple of stands and if I came back next year, I'd pick Hot Dog on a Stick over the others. I was waiting for some friends to come to share the Mexican funnel cake with them, but they bailed last minute. It comes in a jumbo size only, so I wasn't able to finish it and it became a sugar overload by the fifth bite or so. But if you're craving some deep fried butter (SHUDDER!) or chocolate covered bacon, this is your one stop shop to make sure to hit up- but only until August 15th!